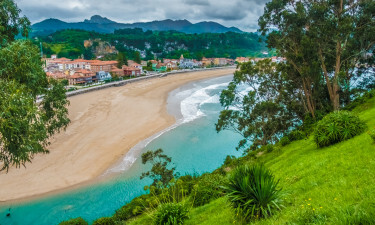 The Green Coast of Cantabria is the perfect destination for a camping holiday. Set between stunning white sand beaches and dramatic mountain scenery, the Costa Verde region is comparatively undeveloped and includes nature reserves with abundant wildlife. Capital of the region is Santander with its many beaches, picturesque harbour and historic cathedral. A holiday at a luxury camping site is the best way to experience the natural environment of this stunning corner of Spain. The Camping Playa Joel has direct access to a superb sandy beach. Parking is free and the luxury mobile homes are well-equipped. Onsite, you will find a supermarket and a cafe-bar restaurant; Wi-Fi is available in the reception area. Facilities include an outdoor pool, tennis court, table tennis and mini-golf and there is a children’s club during the summer. Situated in Oyambre Nature Park, the rustic mobile homes of Caravaning Oyambre are equipped everything you need for camping luxury. The site is near the beach; it has a pool, restaurant and children’s playground and is the ideal base for hiking and cycling holidays. Enjoy a luxury camping holiday in the heart of Green Spain in an environmentally friendly mobile home at Camping Laredo, situated in magnificent countryside midway between Santander and Bilbao. The lodges are equipped with all the comforts of home and on site facilities include a supermarket, cafeteria, pool and children’s play area. 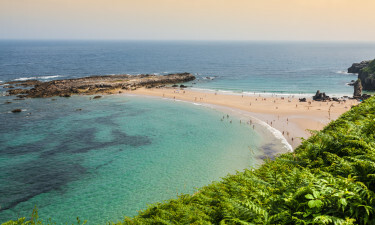 The 60+ beaches that make up the coastline of Cantabria are very diverse, from the bustling Blue Flag beaches around Santander to unspoilt stretches of soft sand such as Pur Diaz, which is perfect for birdwatching. All water sports are catered for, including windsurfing, kayaking and diving. The little resort town of Covachos has a beautiful beach that is popular with nudists. At Gulpiyuri, you can walk across a meadow to find a unique beach 100m from the sea. 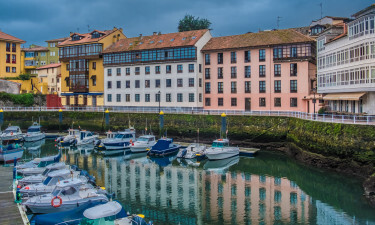 The estuaries, marshlands and mountain ranges of Cantabria support the many rare plants, birds and animals to be found in the region's numerous ecological reserves. Thanks to the temperate climate, the gastronomic delights of Cantabria are amongst the best in Spain. Shellfish, squid and anchovies are local delicacies; try the blue cheeses such as queso picon that is often served with steak. Sobaos are buttery sponge cakes served at breakfast. Local pork products are delicious; wash your meal down with local cider or artisanal beers. Cantabria has warm summers and mild winters: snow sometimes falls in the mountains. In summer, average daytime temperatures are in the 20s, perfect for days on the beach. 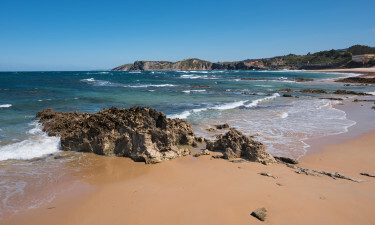 The region’s maritime climate means that rain showers are possible at any time of the year; this accounts for the verdant landscape, so different from the rest of Spain.